This article is about the U.S. Coast Guard version of the Sikorsky S-70 helicopter series. For an overview of the S-70 series, and for its civilian models and operators, see Sikorsky S-70. A HH-60J Jayhawk from CG Air Station Astoria. The Sikorsky MH-60T Jayhawk is a multi-mission, twin-engine, medium-range helicopter operated by the United States Coast Guard for search and rescue, law enforcement, military readiness and marine environmental protection missions. Originally designated HH-60J before being upgraded and redesignated beginning in 2007, the MH-60T is designed to fly a crew of four up to 300 mi (483 km) offshore, hoist up to six additional people on board while remaining on-scene for up to 45 minutes and return to base while maintaining an adequate fuel reserve. Normal cruising speed of the MH-60T is 135 to 140 kn (155 to 161 mph) and the aircraft is capable of reaching 180 kn (207 mph) for short durations. The MH-60T can fly at 140 kn (161 mph) for six to seven hours. Chosen to replace the HH-3F Pelican, the MH-60T is a member of the Sikorsky S-70 family of helicopters and is based on the United States Navy's SH-60 Seahawk helicopter. Development began in September 1986, first flight was achieved on 8 August 1989, and the first HH-60J entered USCG service in June 1990. Production ended in 1996 after 42 helicopters were produced; three retired SH-60F Seahawks were also remanufactured to MH-60T specifications beginning in 2010. A total of 42 MH-60Ts are in service with the Coast Guard. Chosen to replace the HH-3F Pelican, the HH-60J was based on the United States Navy's SH-60 Seahawk and a member of the Sikorsky S-70 helicopter family. Compared to its predecessor, the HH-3F, the HH-60J is lighter, faster, and equipped with more sophisticated electronics and more powerful engines. The HH-60J was developed in conjunction with the U.S. Navy's HH-60H Rescue Hawk. Sikorsky began development in September 1986 and aircraft registration number 6001 achieved first flight on 8 August 1989. The first aircraft was delivered to the USCG for developmental testing in March, 1990 at NAS Patuxent River, Maryland. In March 1991, ATC Mobile, Alabama became the first USCG unit to fly the HH-60J, allowing instructor pilots to prepare for pilot training. Coast Guard Air Station Elizabeth City, North Carolina was the first USCG operational unit to fly the HH-60J. Sikorsky produced 42 HH-60Js with sequential registration numbers from 6001 through 6042. Sikorsky ended production in 1996 after completing the 42 units on contract. Subsequently, the Coast Guard has converted three ex-Navy SH-60F Seahawks into MH-60T Jayhawks (registration numbers 6043-6045) as attrition replacements. The USCG began converting its 42 HH-60Js to MH-60Ts in January 2007. This avionics and capabilities upgrade is part of the USCG's Integrated Deepwater System Program and will provide a glass cockpit, an enhanced electro-optic/infrared sensor system as well as a radar sensor system and airborne use of force capability. The airborne use of force package includes both weapons for firing warning and disabling shots and armor to protect the aircrew from small arms fire. The MH-60T upgrades were completed in February 2014. With a fuel capacity of 6,460 lb (2,930 kg), the HH-60J is designed to fly a crew of four up to 300 mi (483 km) offshore, hoist up to six additional people on board while remaining on-scene for up to 45 minutes and return to base while maintaining an adequate fuel reserve. Normal cruising speed of the HH-60J is 135 kn (155 mph) to 140 kn (161 mph) and the aircraft is capable of reaching 180 kn (207 mph) for short durations. The HH60J can fly at 140 kn (161 mph) for six to seven hours. The HH-60J uses the NAVSTAR Global Positioning System as its primary long range navigational aid, using a Collins RCVR-3A radio to simultaneously receive information from four of the NAVSTAR system's 18 worldwide satellites. The helicopter is normally based on land but can be based on 270 foot medium endurance Coast Guard Cutters (WMEC) or 378 ft high endurance Coast Guard Cutters (WHEC). The Jayhawk has a radar for search/weather that gives its nose a distinctive look. A forward looking infrared (FLIR) sensor turret can be mounted below its nose. It can carry three 120 US gal (454 L) fuel tanks with two on the port side rack and one on the starboard side rack. The starboard side also carries a 600 lbf (2.67 kN) capacity rescue hoist mounted above the door. The hoist has 200 ft (61.0 m) of cable. The MH-60T is equipped with a 7.62 mm M240H medium machine gun and a .50 in Barrett M82 semi-automatic rifle for firing warning and disabling shots. These weapons also serve as defensive armament. Haitian earthquake victims are unloaded from a HH-60J at U.S. Naval Hospital Guantanamo Bay. In 1990, HH-60J Jayhawks began replacing HH-3F Pelican and CH-3E Sea King helicopters in service with the US Coast Guard. HH-60Js perform search and rescue missions, along with other missions such as maritime patrol and drug interdiction. Coast Guard cutters with their HH-60Js and other helicopters performed security and interdiction in the Persian Gulf in 1991 in support of Operation Desert Storm and also in 2003 for Operation Enduring Freedom. In January 2011, Juneau Mountain Rescue volunteers, working with the Alaska State Troopers and the Coast Guard, rescued an injured hiker on Ripikski Mountain, near Haines. A Coast Guard MH-60 Jayhawk helicopter, dispatched from Sitka, transported the hiker to Bartlett Regional Hospital in Juneau, Alaska. On 29 October 2012, Jayhawk number 6031 (70-1790) was used during the offshore rescue of the crew of HMS Bounty during Hurricane Sandy. Starting in 2009, Coast Guard Jayhawks have been tasked with a secondary mission of drug patrol/enforcement. These missions are usually conducted in cooperation with coast guard cutters. Medium range recovery helicopter. 42 units delivered to the USCG between 1990 and 1996. Medium range recovery helicopter. 39 surviving HH-60J airframes received upgraded avionics and operational capabilities, including armaments, between 2007 and 2014. Three SH-60Fs were converted to MH-60T specifications as attrition replacements. A Jayhawk retrieves a rescue swimmer. As of July 2010, three Jayhawks have been involved in crashes, including two fatal crashes. Most data is for HH-60J with data for MH-60T noted below. ^ a b Leoni, Ray D. Black Hawk, The Story of a World Class Helicopter, pp. 212-213. American Institute of Aeronautics and Astronautics, 2007. ISBN 978-1-56347-918-2. ^ "Sikorsky HH-60J Jayhawk". Helis.com. Archived from the original on 8 July 2010. Retrieved 7 July 2010. 42 delivered from 1990. 1 written off. ^ a b Aviation Update newsletter. US Coast Guard, January/February 2007. ^ Acquisition Update: Final Jayhawk Completes Conversion to MH-60T Model. U.S. Coast Guard, 19 February 2014. ^ "Coast Guard Helicopter Interdiction Tactical Squadron" (PDF). USCG.mil. USCG. Retrieved 14 January 2017. ^ a b Tomajczyk, Stephen F. Black Hawk, pp. 74-74. MBI, 2003. ISBN 0-7603-1591-4. ^ "Coast Guard Medevacs Injured Hiker From Ripikski Mountain". Coast Guard News. 6 January 2011. Retrieved 21 March 2015. ^ "Office of Aviation Forces (CG-711) "Jayhawk"". uscg.mil. Retrieved 2 February 2013. ^ Liesik, Geoff (5 March 2010). "U.S. Coast Guard team to probe Uinta Mountains crash". Deseret News. Salt Lake City, UT: Deseret News Publishing Co. Archived from the original on 8 July 2010. Retrieved 7 July 2010. The Jayhawk that crashed was one of two returning to North Carolina from Washington state.... It was last heard from just before 10 a.m. Wednesday. ^ Green, Sara Jean (7 July 2010). 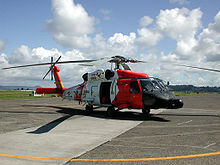 "3 dead in Coast Guard copter crash off La Push". Seattle Times. Seattle, WA: The Seattle Times Company. Archived from the original on 8 July 2010. Retrieved 7 July 2010. The MH-60 Jayhawk helicopter crashed around 9:30 a.m. off James Island near the mouth of the Quillayute River at the northwest tip of Washington state. ^ S-70B Seahawk Technical Information, 2001. ^ "S-70B Seahawk Helicopter Technical Information S70-064 1438 3C" (PDF). Sikorsky Aircraft. January 2008. Archived from the original (PDF) on 8 July 2010. Retrieved 7 July 2010. ^ Pike, John. "HH-60J Jayhawk Specifications". GlobalSecurity.org. Retrieved 7 July 2010. Wikimedia Commons has media related to HH-60 Jayhawk.